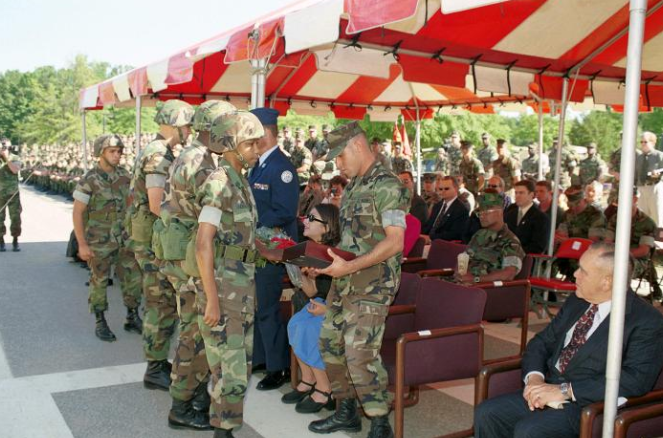 Members of Sergeant (SGT) Manuel A. Cox's family are presented with flowers and an award at his building dedication at The Basic School ( TBS) aboard Marine Corps Base Quantico, Virginia, on July 7, 2000. Died: December 4th, 1983 in Beirut, Lebanon. Incident: Died of injuries received when his OP came under fire by the enemy. 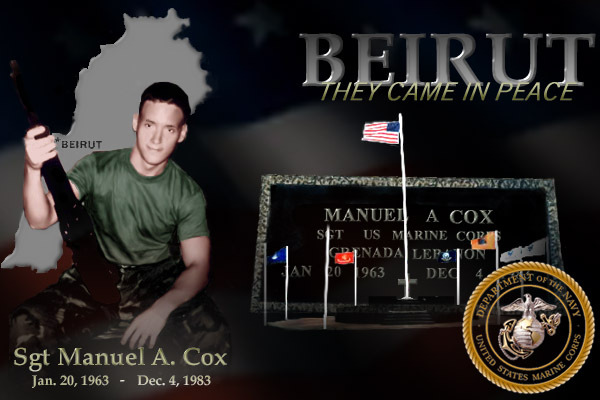 United States Marine Sergeant killed in the terrorist attack on Marine Positions at the Beirut Airport in Beirut Lebanon. ​Burial: Ocean County Memorial Park, 1722 Silverton Rd, Toms River, NJ 08753 - Veterans' Garden-Section D, Row Circle, Plot 1720. Sgt Manuel A. "Manny" Cox, He was a squad leader in Golf Co, 2/8. His squad manned Observation Post 76 on 4 ..hat was the same day the United States lost two fighter-bombers in air strikes against Syrian targets, with one pilot killed and the other captured. Cox's squad came under fire by Shiites bent on killing them all and stealing their weapons and ammunition. By all accounts the fighting was ferocious. It lasted for hours, and Sgt Cox conducted himself in a manner that was described by one observer as "simply awesome." "He called for and adjusted artillery fire and mortars, gave fire commands to his Marines, the whole deal. He and his Marines fought like hell that night," said Mike Ettore, a fellow Marine who said he was monitoring the fight on radio. "Somebody got an hour of the fight on a tape recording. I've always thought they should have that tape in squad leader school and say, 'OK, listen to this. Here's how Marines should be led in combat.' " Tragically, the last enemy round of the night made a direct hit on OP 76, killing Cox and seven of his Marines.